Asapiprant is a potent and selective DP1 receptor antagonist with a Ki of 0.44 nM. Tiaprost is a prostaglandin F2α (PGF2α) analogue. 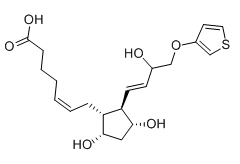 Prostaglandin h2 is a cyclic endoperoxide intermediate produced by the action of CYCLOOXYGENASE on ARACHIDONIC ACID. It is further converted by a series of specific enzymes to the series 2 prostaglandins. Ornoprostil is a prostaglandin E1 analogue that acts as a mucosal protectant. Benorilate is an ester of aspirin and paracetamol with analgesic, antipyretic, and anti-inflammatory activity used in the treatment of rheumatoid diseases. Benorilate has less severe side effects than aspirin. Tafluprost acid is a selective agonist at the prostaglandin F receptor, increasing outflow of aqueous fluid from the eyes and thus lowering intraocular pressure. 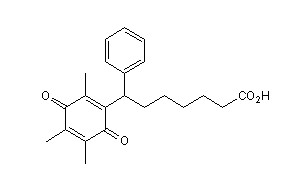 Seratrodast is a potent and selective thromboxane A2 receptor (TP) antagonist.